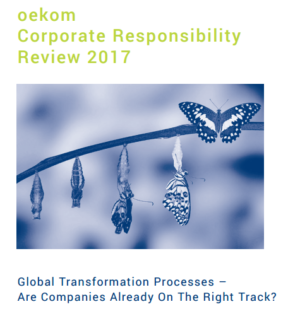 Oekom research presents the Corporate Responsibility Review 2017. For the first time ever, the independent sustainability research agency has identified a more than just slightly upwards trend in its latest annual report on sustainable business governance around the globe. One of the possible reasons for this trend, which is most noticeable in the midfield of the rated businesses, can be seen in the pressure to change and the impulses for increased sustainability which are impacting companies from many angles. These include international initiatives such as the UN Sustainable Development Goals (SDG), national regulations, increasing demands of sustainable capital markets, and a general rise in sustainability awareness. 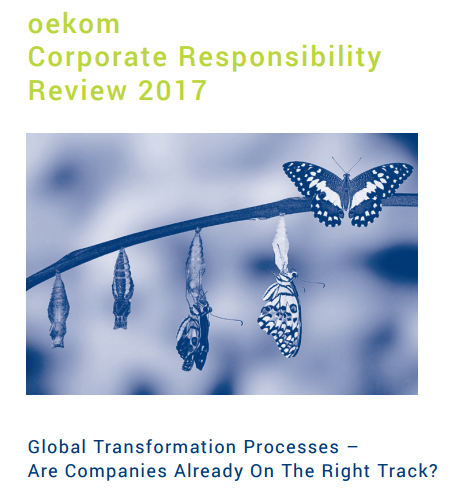 Businesses also need to respond increasingly to transformation processes in the economy, e.g. decarbonization in the energy sector, and e-mobility in the automobiles industry. The study shows clearly that not all industries are equally well prepared to face these opportunities and challenges. Consequently, there is still considerable room for improvement, with industry having a long way to go before it can speak of holistic sustainability. Hey Buddy!, I found this information for you: "Corporate Sustainability Performance improves worldwide". Here is the website link: https://www.duurzaam-ondernemen.nl/corporate-sustainability-performance-improves-worldwide/. Thank you.